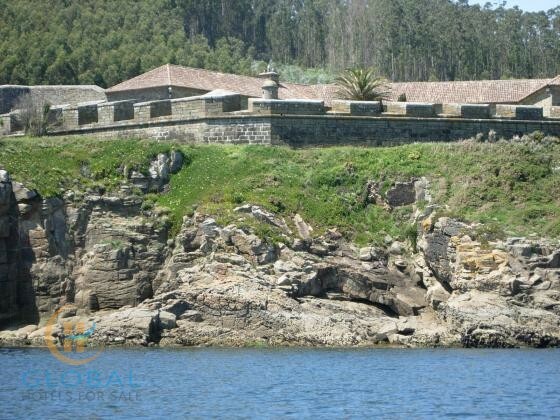 This unique 18th century castle is located in a privileged location, 12km from the second most visited place in Galicia, declared a World Heritage. One of its charms is that it is renovated as it was in its origin, therefore living in it´s like living in the eighteenth century but with the comforts of the 21st century. This property has a lot of history, it have resisted Napoleon's troops and the incursions of numerous pirates. Its approximate surface is 50.000m2, in the middle of nature and bordering on native forests. There is direct access to the sea and two coves in the farm and cave. Of the 2.700m2 built approximately 700m2 are useful and expand on one floor, without architectural barriers and views of the sea and the mountains and coastal towns from the entire property. It has 4 interior gardens, well and springs of great flow. Inside there is central heating and private light line, telephone, wifi, mobile phone coverage and central alarm. It would be feasible to create a heliport and some mooring on the coast. It´s an ideal place for luxury tourism, spa hotel, signature restaurant or simply to live in a natural, maritime, unique and unparalleled environment.